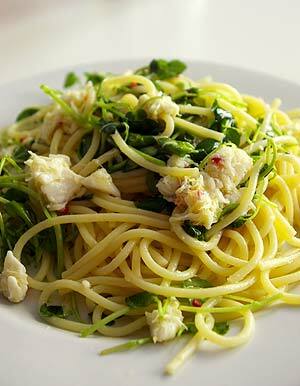 as i’ve mentioned before, twice, crab linguine is a regular standby supper for me – the tinned white crab meat that you can buy is very good and, with some lemon juice and zest, raw chilli and garlic plus olive oil added you end up with something very tasty. i usually add watercress to the mix too, although if you can’t get it rocket is a good alternative. the dish above, and its matching pair for david, was made with my standard recipe (the links above are for two variations on the theme) one tin of white crab meat, juice and zest of half a lemon, one small but potent chilli from our chilli plant, a crushed clove of garlic, handful of shredded watercress and glug of olive oil. plus spaghetti as we were out of linguine. the perfect easy supper. i'm sharing this plate of pasta with haalo of cook (almost) anything who is hosting this month's presto pasta nights.